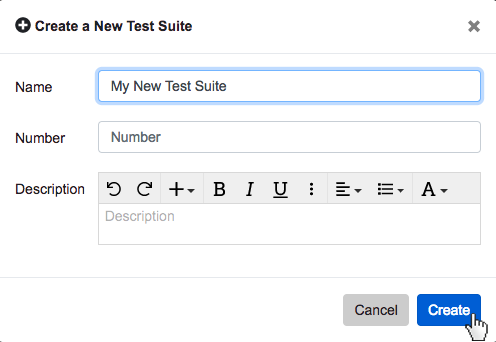 Within 'Test Center,' users can create a new test suit by clicking the '+ New Test Suite' button on the right of the page. Clicking the '+ New Test Suite' button will open the New Test Suite dialog. You will be prompted to input a test suite 'Name,' 'Number' (optional), and 'Description' (optional). Then, click the 'Create' button. Within ‘Test Center,’ users can create a new test suit by clicking the ‘+ New Test Suite’ button on the right of the page. Clicking the ‘+ New Test Suite’ button will open the New Test Suite dialog. You will be prompted to input a test suite ‘Name,’ ‘Number’ (optional), and ‘Description’ (optional). Then, click the ‘Create’ button.